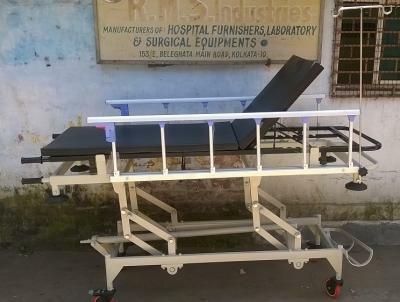 Tabular trolley for height adjustment. Smooth gear mechanism to obtain head down position. two sectional Stainless Steel top with head raise on ratchet. Mobile on 12mcm castors. two with brake. Provided with cylinder cage, I.V Road and Aluminium moulded collapsible safety rails. Revolving buffers on all four corners of the trolley.Supplied with two sectional Mattress pretreated epoxy coated finish. Overall Size : (210L X 67W X 65/85 H).